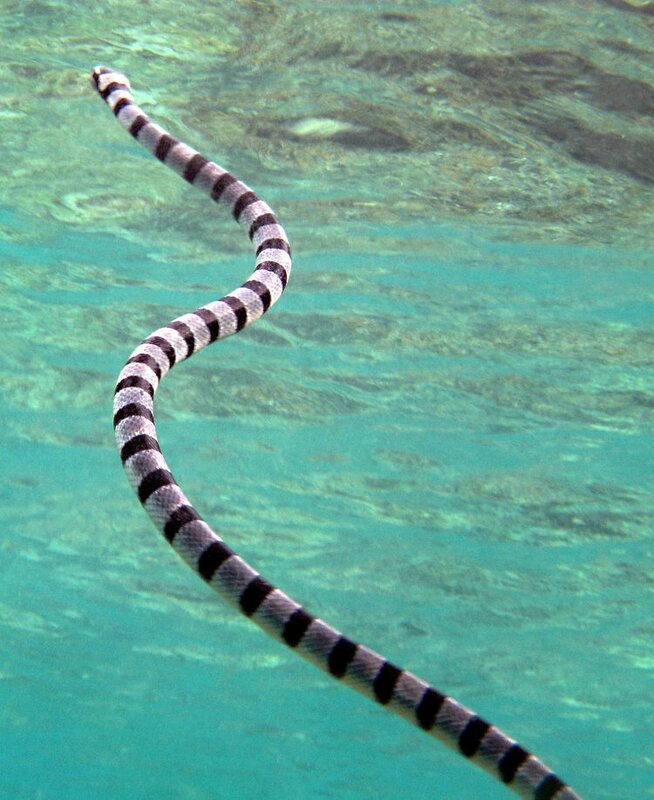 The sea snake is a venomous aquatic-dwelling snake that feeds on fish and other small marine creatures. The snake is normally docile and may become aggressive when attacked or during mating season. All Sea Snake Bites should be evaluated by a trained medical professional, as early as possible. Failure to obtain prompt evaluation and appropriate treatment may result in severe complications and/or death. Call 911 (within the US) or your local emergency number immediately, if you experienced a Sea Snake Bite. What is Sea Snake Bite? Sea Snake Bites usually take place unintentionally or inadvertently, when individuals come in contact with venomous sea snakes. What are the Causes of Sea Snake Bite? What are the Signs and Symptoms of Sea Snake Bite? The signs and symptoms of Sea Snake Bites depend on the age (whether child or adult), body weight, and overall health status of the individual (whether having an underlying condition or illness). Also, the signs and symptoms vary according to the potency of the snake and amount of venom injected. How is First Aid administered for Sea Snake Bite? If a Sea Snake Bite (or sting or bite of a marine creature) is suspected, it is always important to call your local emergency helpline number (or dial 911 in the US) without any delay, and provide as much information as possible, even if the individual does not have any symptoms. It is important to note that pressure immobilization bandaging is not the same as providing a tourniquet, which is essentially a constriction of the body part to control blood flow for a certain period of time. Any indiscriminate use of antivenom serum either due to improper training and knowledge or under compulsion from the victim’s family or friends is therefore highly discouraged. Nevertheless, a qualified healthcare provider is best-placed to determine whether the administration of AVS is necessary or not in each and every specific case. Who should administer First Aid for Sea Snake Bite? Sea snake bites are generally painless (initially), may barely show any local swelling, and may go unnoticed by the victims. Nevertheless, for all cases involving actual or suspected sea snake bites, it is very important to immediately seek the advice, evaluation, and treatment of a qualified healthcare provider. What is the Prognosis of Sea Snake Bite? In many cases, with urgent first aid, prompt treatment and hospitalization of the victim, the prognosis is typically good. Without treatment or access to proper healthcare, deaths from severe systemic symptoms and complications from Sea Snake Bites have been reported. How can Sea Snake Bite be Prevented? All sea snake bites should be considered as medical emergencies and accorded prompt attention with evaluation by trained medical professionals, as soon as possible, particularly in the first 4-8 hours. Alirol, E., Sharma, S. K., Bawaskar, H. S., Kuch, U., & Chappuis, F. (2010). Snake bite in South Asia: a review. PLoS neglected tropical diseases, 4(1), e603. White, J., & Meier, J. (2017). Handbook of clinical toxicology of animal venoms and poisons. CRC Press. Trethewie, E. R. (2013). The Pathology, Symptomatology, and Treatment of Snake Bite in Australid. Venomous Animals and Their Venoms: Venomous Vertebrates, 103. Haidar, N. A., & Deitch, E. (2015). Snake bites in the Arabian Peninsula, a review article. Journal of arid environments, 112, 159-164. Trethewie, E. R. (2013). The Pharmacology and Toxicology of the Venoms of Snakes of Australia and Oceania. Venomous Animals and Their Venoms (New York: Academic Press, 1971), II, 79-101. Bawaskar, H. S., & Bawaskar, P. H. (2015). Snake bite poisoning. Journal of Mahatma Gandhi Institute of Medical Sciences, 20(1), 5. Rita, P., Animesh, D. K., Aninda, M., Benoy, G. K., Sandip, H., & Datta, K. (2011). Snake bite, snake venom, anti-venom and herbal antidote-a review. Int. J. Res. Ayurveda Pharm, 2, 1060-1067.